Today, many dedicated volunteers from all walks of life work with paid staff to provide assistance free of charge to children and parents in need. A few hours of your time – on a regular basis or every once in a while – will help prevent child abuse in our community and will make a difference in a child’s life. 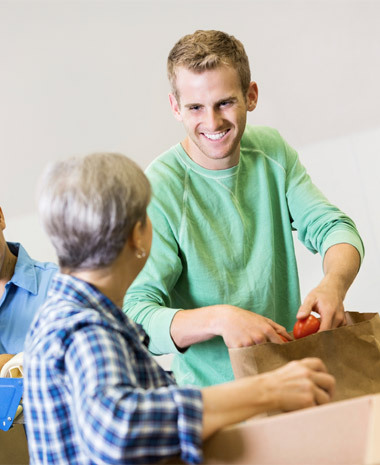 You can choose how often you want to volunteer – from once a week to once a year! For those who wish to volunteer on a regular basis, our 24-hour Family Helpline always needs dedicated volunteers to counsel callers over the phone. For those who are interested in an annual opportunity, our Giving Tree volunteers help us provide holiday gifts for the children whom we serve. If you would like to work directly with children, we have opportunities for volunteering on a regular basis. These include: helping in our Childcare facility or assisting with our seasonal programs. The satisfaction of knowing you are making a difference in a child’s life. For more information or to volunteer, please contact our Volunteer Coordinator, Holly Hahn-Baker at 716.822.0919 or via email hhahnbaker@familyhelpcenter.net. From MSW interns to undergraduate interns, eligible students may receive credit hours as well as valuable professional and personal experience. For more information on Internships, please contact Brienna Hill at 716.822.0919.